Railway Board will soon give the opportunity to change cadre (department) in view of the problems of female personnel working on the post of driver, guard, and gangman. They can be kept on ticket checkings and Babu's post. In this regard, the Department of Personnel has been ordered to take appropriate steps after making the policy. Female personnel working on the rank of driver, guard, and gangman in the railway have to work in uneven conditions. Actually, the number of women workers in these posts is very small compared to male employees. This makes him feel uncomfortable in the work. Second, worry about their safety is also concerned. As the lady guard has to take the goods train. In the night the maulgadi is ever stopped in the jungle. In such a situation, the lady guard is afraid of security. Drivers are not available to female personnel in the engine toilets. In the same way, there are only one or two female workers in the gang working in the tracks, so it seems uncomfortable for them to work among male employees. Union unions are also raising the problems of women employees who work on the above posts. Railway Board Chairman Ashwini Lohani met on July 17 with six officers from different railway boards in Delhi to further improve the functioning of the railway. There were also eleven officers of the Railway Board in this meeting. 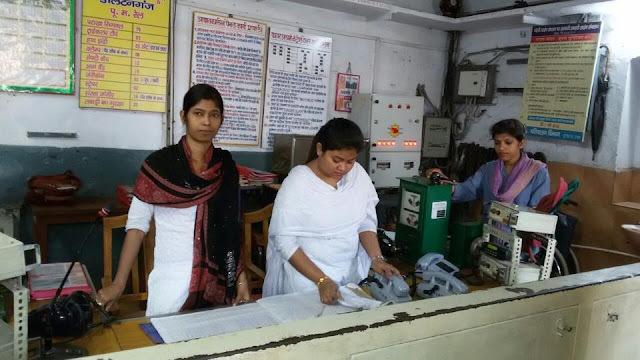 On this occasion, the board officials kept the problems of women working in the said cadre related to the operation, which the board officials considered to be justified. On this, it was decided to give women workers of the said cadre an opportunity to change the cadre. About 100 female workers are employed in the Jhansi Railway Board as guards, drivers, and gangmen. In this regard, Public Relations Officer Manoj Kumar Singh said that the policy is being formulated at the level of the Railway Board. How to Write Article for Blog and Website in 10 Minutes ? megee khaane se aise hota hai sehat ko nukasaan? How to Make Your Website and Make Earning A Home? Bolging English News Healths Hindi News Online Earn Money Poco F1 Railway Jobs Railway News Xiaomi Xiaomi Poco F1.